I’m 97.864% (rough estimate) sure you’re aware that just over 12 hours ago, more than 2 billion people around the world watched as Prince William married the now-Princess Kate. It’s just one of those things: you were either with it, or totally not. I’m going to confess that I was smitten. Without an ounce of boredom, I watched 7 full hours of live coverage while furiously tweeting. Don’t judge. What’s not to love? 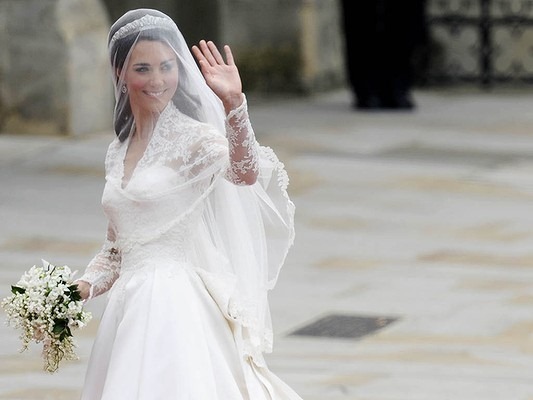 The crowds, the buzz, the fairytale story and of course the dress. Doesn’t she look breathtaking? Don’t think that I spent those 7 hours without eating, though. After all, what’s a royal wedding without some royal food? 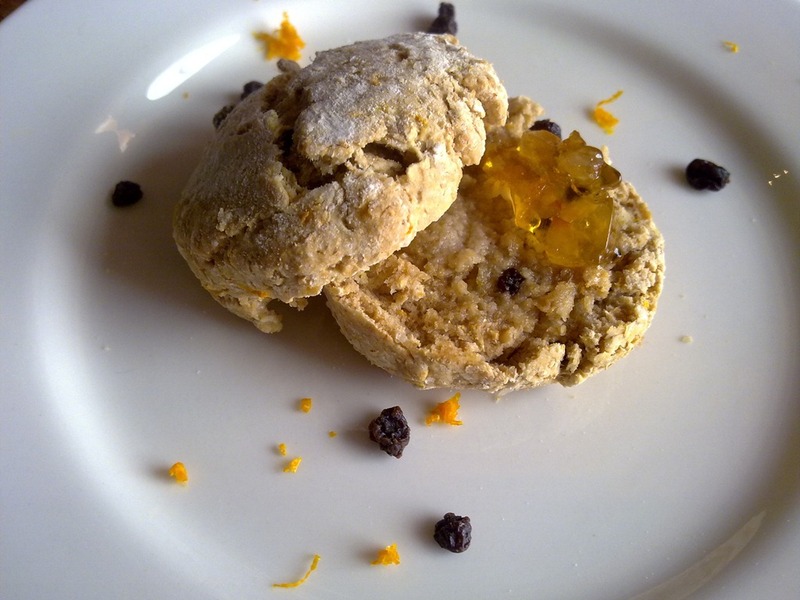 This delightful scone is a bit ‘fancy’ – infused with Earl Grey tea and touched with a hint of orange zest. It’s an easy, single-serve treat fit for a queen princess! 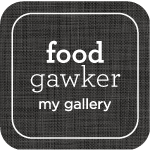 Adapted from Taste. Preheat oven to 375F/200C. Heat the milk in a small bowl using a microwave. The milk should be quite hot and steaming, this took 30 seconds on high in my 800W microwave. Adjust times accordingly. Place the tea bag in the milk and press it down lightly using a teaspoon to aid in brewing. While the milk is being infused with the tea, mix together the flour, baking powder, salt, sugar, orange zest and currants. Using your fingertips, rub the margarine into this mixture. Squeeze the teabag to get the milk it has ‘absorbed’ before discarding. The milk should now be light brown in color. Add the milk the the flour mixture. Begin combine the mixture by cutting through it with a knife. Combine completely with wet hands until you have formed a dough. Shape the dough into a scone and place on a floured (all-purpose flour) baking tray. Dust scone with a little more flour. Bake for 10-12 minutes or until scone is golden. Serving ideas include vegan margarine, jam, marmalade and cream. Makes one scone. 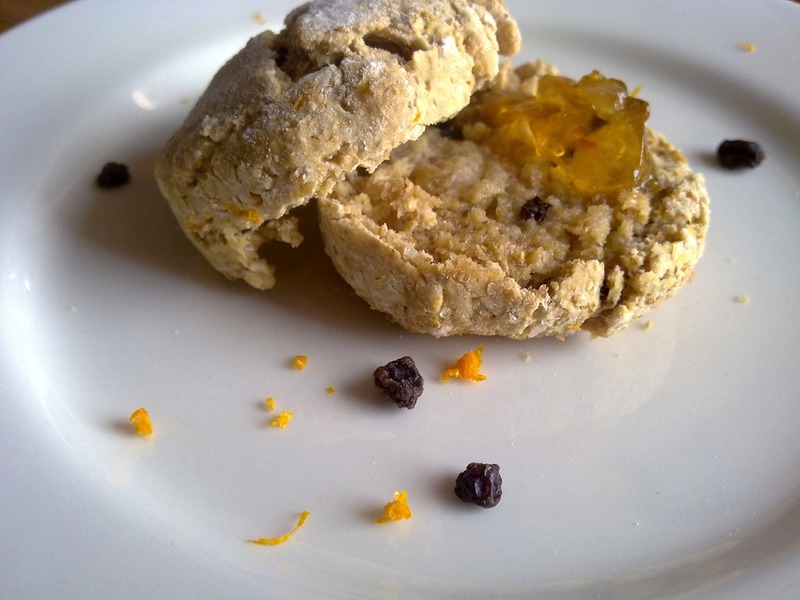 This scone was blissful served warm with vegan margarine, orange marmalade, and of course a cup of earl grey tea. Did you join in all the excitement of the royal wedding? How did you celebrate? I love that photo of your scone. Looks good. I didn’t watch- didn’t even know about it until yesterday. I am so far out of the loop. Thank you! Don’t worry, a lot of people I know were caught unaware too. I would’ve loved one of those cupcakes! A single-serve scone…how awesome are you?! A lot, that is the answer. This looks awesome! Hahaha thank you 😀 A lot of my friends didn’t understand how I could be so obsessed with the wedding either. kate is seriously SOOO GORGEOUS!! And I loved her dress (the second one especially!!) I love that youmade scones to celebrate the big day; we made english muffins and tea, it was scrumptious! She is, isn’t she?! I agree, that second dress with the diamond waist was stunning. Thank you 🙂 I agree, I certainly see this at a spring party.